Airdrie United could yet be playing in Division One next season. Stuart Kenny asks are Airdrie the most fortunate team in Scotland? After receiving a possible promotion on a technicality, following the reincarnated Rangers demotion to Division Three, Airdrie United fans may feel like the most fortunate support in Scottish football. The Diamonds could play their trade in Division One next season after qualifying for promotion due to their loss in the play-off final last May, but this incident alone is not responsible for the emerging feeling of luck around New Broomfield. Rather, the sensation appears in light of the fact that this is by no means the first time the Airdrie side have benefited from a fellow Scottish club’s financial sorrow. After being formed in 2002 following the bankruptcy of Airdrieonians, it was in the 07/08 season that the first stroke of fortune hit the men in red and white. Following a successful campaign in Division Two, the club had secured a play-off spot, and after dismissing Raith Rovers in the semis only Clyde stood in their way of promotion. Despite this promising result though, it seemed the club’s First Division dreams had been dashed when they suffered a 3-0 aggregate loss in the play-off final. However, with Gretna forced into the bottom tier of the SFL after their liquidation, this proved not to be the case. The pumpkin in Gretna’s Cinderella story opened up a spot in the First Division which Airdrie happily filled, and so with the fall of one team, came the rise of another. The following year was not so enjoyable for Airdrie. After finishing 9th the club were condemned to fight through the play-offs once more, this time for the right to remain in the league in which they had played for the past year. The Diamonds again reached the play-off final, and again came out second best, this time to Ayr United. But once more the hand of fate was willingly waiting to help. 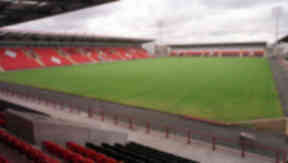 This time it was Livingston condemned to Division Three, and consequently Airdrie were granted permission to alter their pre-season plans to prepare for another quest through the First Division. Unfortunately the 09/10 season saw United legitimately relegated after a play-off loss to Brechin City, and so after a two year fling, it seemed fate had finally turned its back on a prosperous love affair with Airdrie United. Of course though, this was to be the case. The 11/12 campaign saw Jimmy Boyle's Diamonds cruise into the play-off places late on thanks to a tight defence and the prolific Ryan Donnelly’s goals. Despite a loss to Dumbarton in the play-off final, there was a lingering suspicion amongst the Airdrie support of what events would soon come to pass. With football's grim reaper dusting off his beloved Airdrie United shirt, the newco Rangers were scythed to Division Three and it appears that Airdrie are back in the First Division roster, providing the club’s support with a slight tinge of revenge for the part played by former Rangers chairman David Murray in the bankrupting of Airdrieonians. Football is full of little ironies, and it was Murray who effectively put the final nail in their coffin over unpaid debts, declaring that "We're running a business. We have given them repeated warnings and felt they were playing on our good nature". The club will now look to build on a past season of success, and with a higher chance of holding on to Ryan Donnelly now they are playing at a higher level, the Airdrie United support will feel their side is strong enough to remain in the division without the help of any mysterious forces. Whatever the outcome of the upcoming campaign though, it seems the most calculated of footballing boffins would struggle to name a side that have reaped more rewards from other's clubs’ distress than the men at New Broomfield stadium. You can follow Stuart Kenny on Twitter.